Hollie was here visiting for ten days and we went to the Pochote-Xochimilco organic market that is held every Friday and Saturday in the district just beyond Oaxaca’s historic center. I was captivated by the color of the organic blue corn crunchy tortillas, and the ones made from beets, a deep red, were truly spectacular. Hollie is on a gluten-free diet, so this was just perfect to use for chips to dunk into the guacamole — salt and sugar-free, made with sesame seeds and amaranth. One morning, I thought, Why not break them up and use them for corn flakes? So, I did, adding sunflower seeds. One could also use toasted pumpkin seeds or nuts, too. 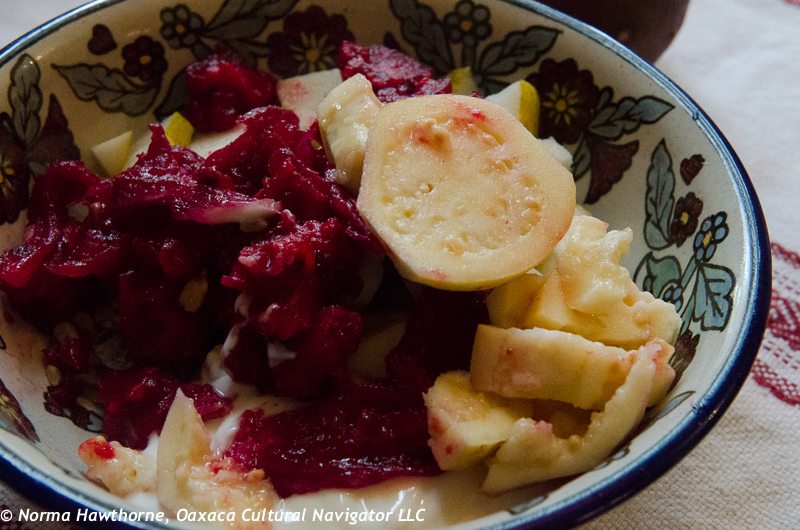 I had on hand fresh fruit: the fruit of the nopal cactus called tuna, guava, bananas, and a pear given to me by David on our trip to Capulalpam picked from his tree. 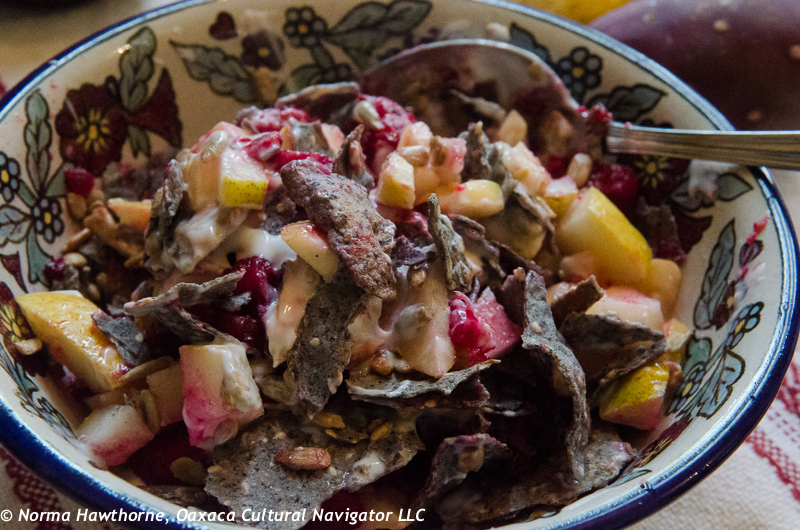 I cut these up into diced pieces, added the fruit to the dried mix, poured natural, unflavored yogurt on top, and there was breakfast. Martha is visiting today and I prepared it again this morning. Muy rico! Try it. Sugar free, gluten-free, organic. 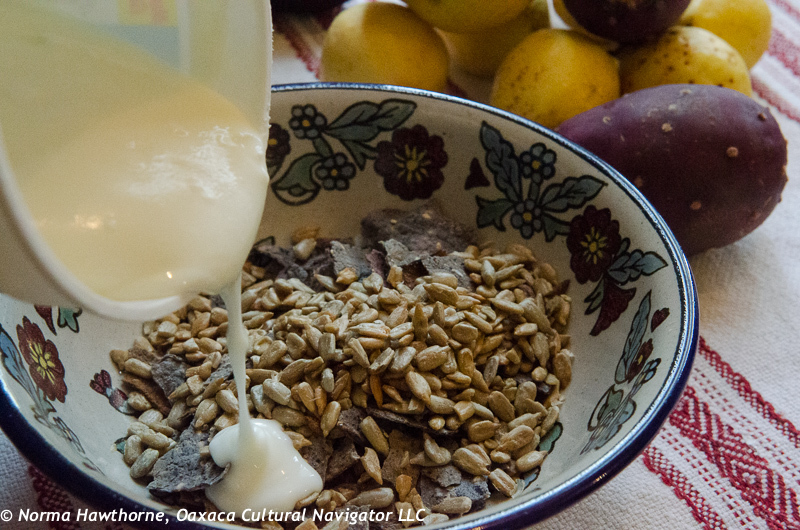 Adapt your own version from available ingredients wherever you live. 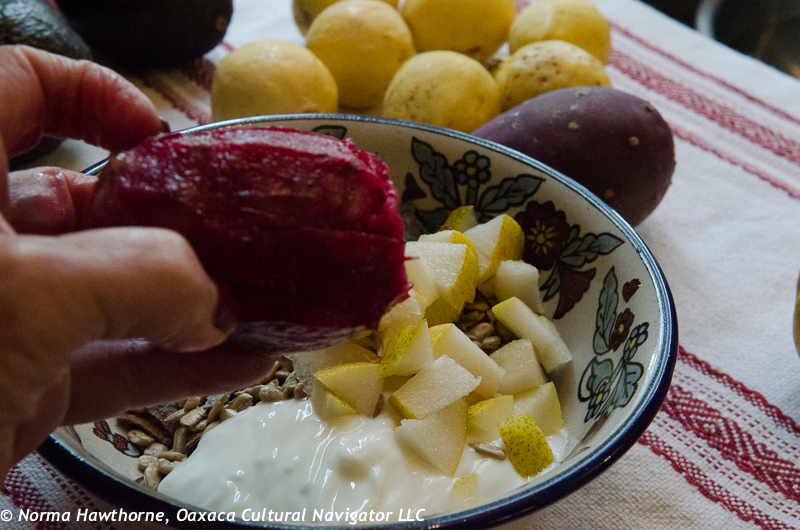 This entry was posted in Oaxaca Mexico art and culture and tagged blue corn, cereal, corn flakes, food, guava, Mexico, nopal, Oaxaca, organic, recipe, tortillas. Bookmark the permalink. That breakfast looks incredible! I just may have to duplicate it here. We used to be able to buy blue cornflakes, but haven’t been able to find any for ages. 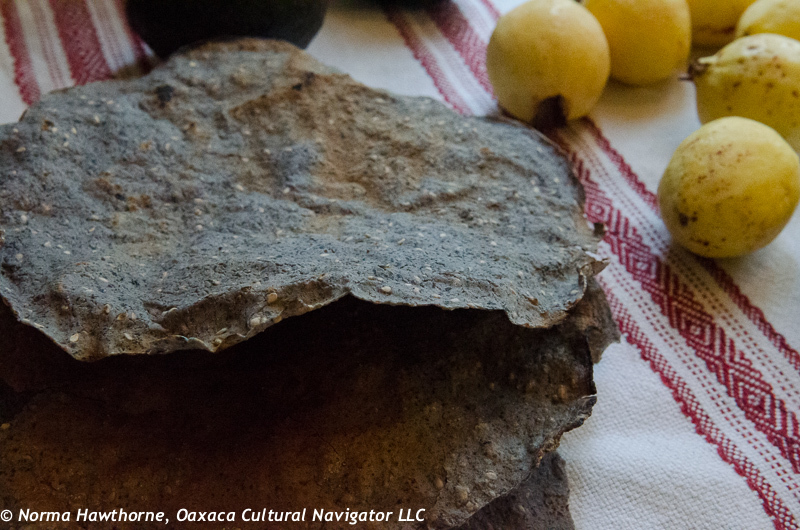 Your idea with the blue corn tortillas might be just the perfect substitute! Julie, so glad this appealed to you! Hope you can find those blue corn tortillas! I loved that breakfast invention of yours. Truly delicious and gave me energy a long time. And wow, the texture! Martha loved it, too. Our bodies were both very happy after breakfast. Hugs.